I’m sure that most of us have heard that how you start your day sets you up for the rest of the day. We couldn’t agree more! Trust us…we have tried and tested these rituals for many years and the days/weeks/months we don’t do them, not only we suffer, however EVERYONE else around us does too! There is something magic about the morning, a new day, another chance, we deeply believe that sunrise should be greeted with ceremony. OK, so we can’t go any further with this blog until we divulge a confession. 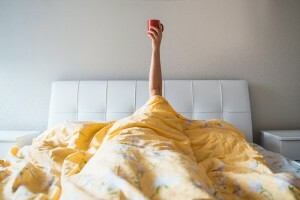 Yes, we know how important morning rituals are, yes we do our best to implement them everyday…no…we don’t do them ALL the time (we are human)! That being said, we always make a conscious effort to start our day right. Aurvedic science has known about this technique for thousands of years. Bacteria builds up over the night and scrapping your tongue to rid your body of them feels amazing! Do this a few times until you get rid of all of the build up. Trust us…this technique is very satisfying and rewarding. Drink at least 500-1000mls of water upon waking. This is the longest time you go without eating of drinking and you are dehydrated the moment you wake! Add some freshly squeezed lemon and pinch of good quality salt to it, to give your body an extra boost. *Please note that if you are pregnant do not have cold showers. Whether you have figured this out yet or not…we are animals! As humans, movement is critical for the functioning of our ENTIRE BEING, including however not limited to maintaining the strength of your muscles, bones, joints, circulation and nervous system. We love natural, function movements in nature – at the beach, in the ocean, on a patch of grass, or anything in the sun are our favs. We love yoga, Tai Chi, QiGong, running, swimming, dancing – just move your body! Extra bonus, if you get a sweat up then you are detoxifying your body even further. When you rush through your morning and out the door, that’s how you will be operating throughout your day. Wake up a bit earlier so you can give yourself the space and time you need to be fully present. Now, we can’t go without saying that your morning begins the night before. If you make sure that you get to bed early so that you can enjoy a good 8 hours of sleep, then your morning will be much more productive. We hope this has helped inspire your morning routine. Are you suffering from ill-health and want some help on your health journey?